MOSCOW, Russia (CNN) -- A Ukrainian general has been arrested in connection with the murder of a journalist nearly nine years ago, the country's president said Wednesday. Ukraine President Viktor Yushchenko has labeled Georhiy Gongadze's killing the country's most important case. Gen. Alexei Pukach was detained Tuesday in connection with the killing of Georhiy Gongadze, who was abducted in September 2000 and later found decapitated. The Gongadze killing is the country's most important criminal case, President Viktor Yushchenko said in a statement on his Web site. "To me, it's a question of honor to resolve the murder of Georhiy Gongadze. 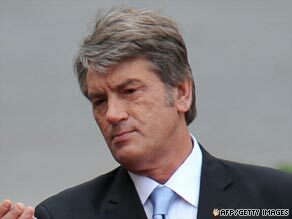 It's a question of whether or not good or evil prevails," Yushchenko said. Organizations ranging from the European Union to the Committee to Protect Journalists have demanded that Ukraine bring the journalist's killers to justice. Pukach had been on the run for years before he was seized Tuesday in a joint operation by the Security Service and the prosecutor general's office, Yushchenko said. He has already been interrogated once and is cooperating with the investigation, the president added. The Committee to Protect Journalists welcomed the arrest, it said in a statement to CNN. "As the suspected organizer of the killing, Pukach could point the investigation to those who ordered the crime nine years ago," said Nina Ognianova, the organization's Europe and Central Asia Program Coordinator. "Only with the masterminds behind bars would Ukrainian authorities be able to reverse the impunity in Gongadze's assassination," her statement said. Three former police officers were convicted last year of killing Gongadze and given jail sentences of 12 to 13 years, the Committee to Protect Journalists said at the time. There has long been suspicion that top Ukrainian government officials were involved in the murder. "Gongadze, the pioneer editor of critical Internet newspaper Ukrayinska Pravda (Ukrainian Truth), had long angered authorities with his highly critical reports detailing corruption in (former President Leonid) Kuchma's administration," CPJ said last year, when the three men were sentenced. Kuchma has long denied involvement in the killing. Pukach was a high-ranking interior ministry official at the time Gongadze disappeared. His former boss, Interior Minister Yuri Kravchenko, was found dead at his country house in March 2005, days before he was to be questioned by prosecutors over the killing of the journalist. The Ukrainian security service, the SBU, suggested Kravchenko killed himself, and the dead man's successor quoted a suicide note, according to Russian media. "Please forgive me, I've become a victim of political intrigues of President Kuchma and his people. I'm leaving you without a twinge of conscience. Farewell," then-Interior Minister Yuli Luzenko quoted the note as saying. But Myroslava Gongadze, the slain journalist's widow, noted Kravchenko had two bullets in his head. "I think it has to be investigated," she said of the death. "He was the main player of my husband's murder ... he was the person who [took] the order and who gave the order," she told CNN at the time of Kravchenko's death. Kuchma had been implicated in the murder by critics who cited secretly recorded audio tapes in which the president allegedly ordered his staff to get rid of the journalist. Kuchma vehemently denied those charges.